ASTC and the Biogen Foundation launched the World Biotech Tour (WBT) in an effort to promote science literacy worldwide and to increase the impact and visibility of biotechnology to youth and the wider general public. The WBT is a three-year research and action program that will improve the professional capacity of science center personnel and create a cohort of young people acting as ambassadors for the project in their communities and beyond. A key part of the project is the Ambassador Program that enlists high school students from around the world to give presentations about dynamic biotechnology topics in their museums, schools and communities to inspire others to get involved. A strong pipeline of scientists is needed to help continue innovation in this field which will impact the lives of millions worldwide as well as the health of our planet. The WBT is building a global network of educated individuals and inspiring the next generation of scientists. Students, between the ages of 13 and 19 years old from different regions around the world participate in the year-long ambassador program which involves science communication training, researching a biotech topic, working with a scientist mentor, and serving as a youth representative of their science centres and the World Biotech Tour. The unique experience the ambassadors gain in the program has changed the way many of the students view the world around them. The reason I joined the World Biotech Tour ambassador program is my interest in the issue of poverty. When I read about poverty, I was greatly shocked, and I began to think about what I could do for this global issue. I then noticed a big argument saying that algae may be a potential answer in alleviating poverty. According to the article, algae contain abundant nutrition and grow naturally in nature. I was very curious and wanted to know more about algae and its future possibilities. That is why I took this topic as my research in the program. I focused on Ethiopia, located at the east side of Africa, because there are many undernourished children. One of the reasons is the low production rate of food because of no good, affordable fertilizer for crops. I thought cheap compost could be the solution but it lacks nitrogen to work as fertilizer. With my research, I realized that Spirulina, algae that grows wild in the lakes of Ethiopia, contains nitrogen. I wondered if it could work as rich fertilizer when mixed with compost and therefore may help solve one of the poverty problems in Ethiopia. In the Ambassador Program, I worked with my mentor for eight months and was supported by scientists and professionals. It was an absolutely fantastic experience. 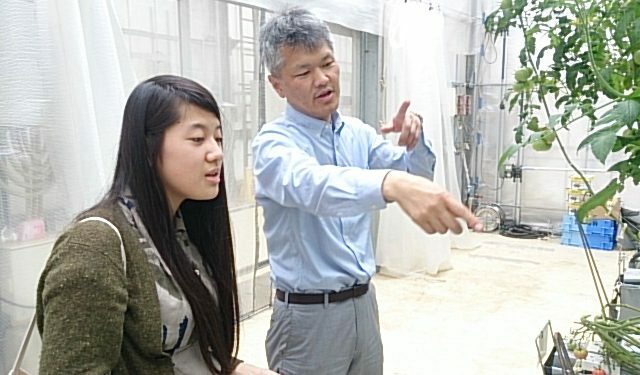 I experimented with how Spirulina could contribute to the growth of Komatsuna (Japanese spinach). In my first experiment, I prepared five kinds of pots: soil, soil with chemical fertilizer, soil with Spirulina, soil with compost, and soil with compost plus Spirulina. I planted Komatsuna seeds, but none of them succeeded in sprouting for some unknown reason. But still through this experiment, I noticed that the soil with Spirulina was too solid to hold water. In my second experiment, I made a slight change and added one more pot of soil with Spirulina and compost. In that pot, I put Spirulina into the soil not all at once, but at separate times; one time in every 14 days, 3 times total. I also vertically placed cotton strings in the pots so that the seeds could get water more easily. As a result, all the Komatsuna seeds sprouted and grew. The best result was the soil with chemical fertilizer, the second best was the soil with compost plus Spirulina added separately. It had a much better result than the pot with just soil, which is the normal condition in Ethiopian farming. From my experiment, I hypothesize the Spirulina works well when it is mixed with compost, and added into the soil separately. I also interviewed people who have experience with agriculture issues in Africa. I learned that adding Spirulina separately is too troublesome in Ethiopia due to the lack of human resources. Also, collecting compost is quite difficult because animals are grazing instead of being kept in an enclosed space. It means, even though I discovered that Spirulina work effectively, still many problems remain in Ethiopia before Spirulina can be used. Nonetheless, I still believe in the possibility of Spirulina and other algae. Maybe we can take Spirulina as a nutritional supplement. Or, when the biofuel made by algae becomes more utilized in the African region, Ethiopia may use the waste of algae from biofuel production more easily in farming. Through this program, I have become much more interested in the future possibility of biotechnology to solve the poverty and undernourishment problems in the world.